Our prices should be considered a guideline/estimate since some prices may vary, and without seeing/knowing what actually will be altered, an exact estimate is difficult to determine. In some cases, there could be more work involved that is not seen until after the initial viewing of your garment. 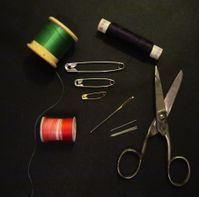 In order to provide you an estimate of costs for your alteration, you will need to make an appointment. AT&T Stadium Concierge Suite Services alterations can be brought in without an appointment during our normal working hours Monday through Saturday. Other items that can be dropped off are those with only a tear, zipper replacement, etc. Formal and Bridal items have a fitting fee due to the work that is involved. Large "lots" of garment alterations will also incur fitting fees due to the time of fitting. Many of our clients have found quality garments at a great sales price, have heirloom garments, or have lost weight and would like to have their garment custom fit, re-sized or re-designed into something new and different for sentimental reasons. Most garment alterations are completed within two weeks (sometimes less), depending on the season. Rush orders are often accepted. Unfortunately, if you need your item faster than our schedule allows, there will be an added rush fee. Turn-around for large/bulk orders is dependent upon current workload, which could result in a 2 - 6 wk turnaround. All clothing and other articles needing sewing services MUST arrive clean and smoke-free. If you have pet hair on your garments, please have this cleaned with a lint-roller prior to your alteration, as the pet hair gets into the machines. There is a minimum $50 fee for washing and/or lint-rolling. Please be sure to have all new garments pre-washed prior to alterations to remove shrinkage. We will decline work we do not feel comfortable altering, or know won't meet a particular deadline. Have your new garments pre-washed prior to your alteration. Have your hem already pinned or marked - saves fitting costs if you have a lot. Have all garments clean to avoid our needing to clean or lint-roll. Avoid rush fees...provide plenty of time for your alteration.